Tapestry weave of dyed wools and undyed linen, H. 188 cm; W. 93.5 cm. Possibly Egypt, 5th century CE. Museum of Fine Arts, Boston, Charles Potter Kling Fund, 57.180. 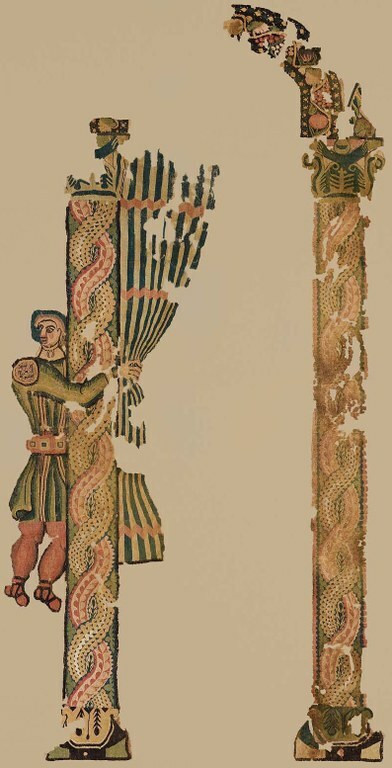 This wall hanging presents a servant, the doorkeeper, pulling aside a striped curtain in an arcade. He is notably well dressed: his tunic is apparently of green-gold “shot” silk, and he wears a gold neckpiece. This type of imagery found on wall hangings commented upon the prestige and status of the household.